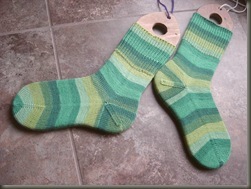 I have a soft spot for Knit Picks sock yarns. Ok there. I admitted it. Seriously though, the value is excellent, and the selection is fun. 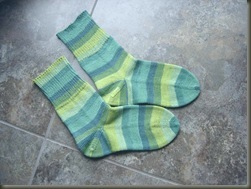 Some time ago, I had unconsciously decided to steer away from self striping or self-patterning yarns. I think maybe it was because I had been doing more cabled and lace patterned socks, so the stripes and fancy yarns tended to get in the way of the design. Lately, there have been a bunch of great colors in the self striping selection from Felici (a 75% Superwash Merino /25% Nylon) Blend Sock Yarn. 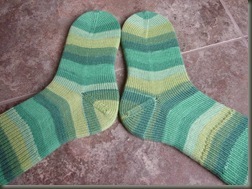 Every now and again, I just feel the need to make some plain jane, vanilla, boring, ordinary socks. The kind where you don't follow a pattern, you don't really plan ahead, you just go for it. This pair had languished for a while. I had started them months ago (back before the Maritime Handspinner's Retreat back in October!) but somehow had gotten ignored in the Jeep. 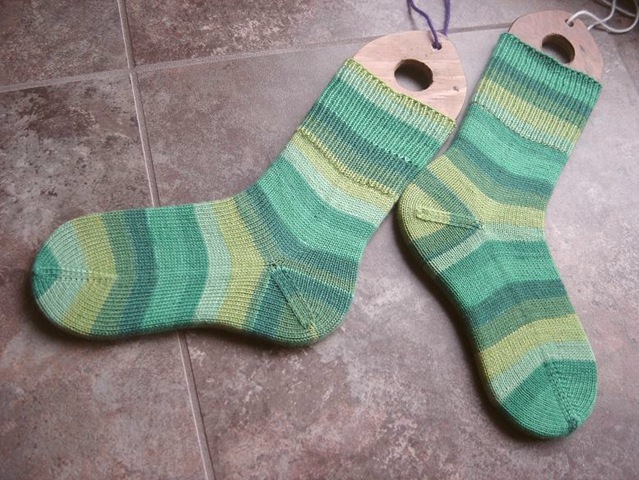 These were my "Car" knitting project, and I kind of forgot they were there! Pattern: Made up as I Went! Knit from the toe up, 2-at-a-time on circulars, afterthought heels. No regard given to whether the yarns were at the same point in the color progression at the starting point. result - clearly related, but more fraternal than identical. I really like the fact that these "match" but aren't identical. I love how the heels and toes look different when you wear them. Felici is soft and comfortable to wear... though I haven't had the heart to really break these in yet. They're too pretty to wear out too quickly! I had underestimated how much yarn was left when I started the cuffs. 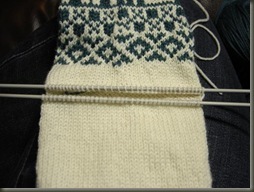 Normally I don't enjoy knitting ribbing, so I don't work too much of it in a cuff. If I make it to 2 inches, I'm doing well. So when I realized I had so much yarn left, I really didn't want to frog and knit more stockinette and then re-do the cuff. I just persevered and knit on... in ribbing... forever. The result is a nice stretchy, soft, springy cuff though. I can see why people like that feeling, and I don't think the socks will slip down as easily. Drat. 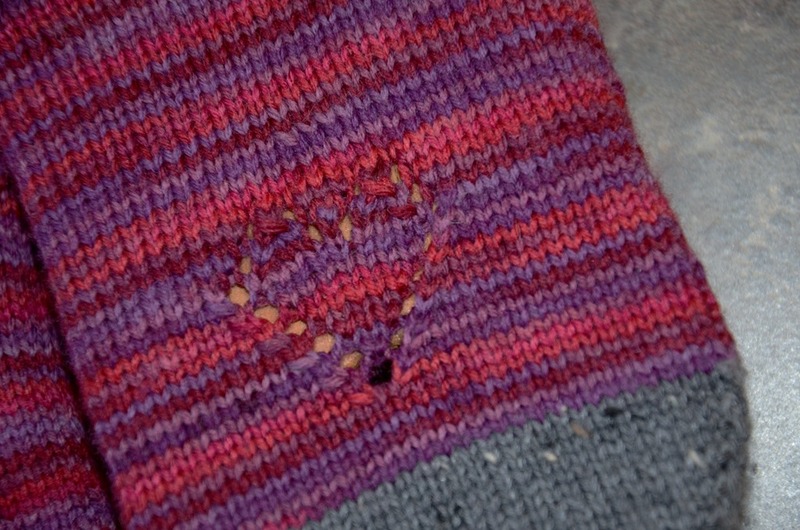 The ribbing, it does *nothing*, is actually useful, and I should consider making more of it perhaps. Drat! How to knit an "Afterthought Heel"
Really when you think about it - a Sock is a Tube. 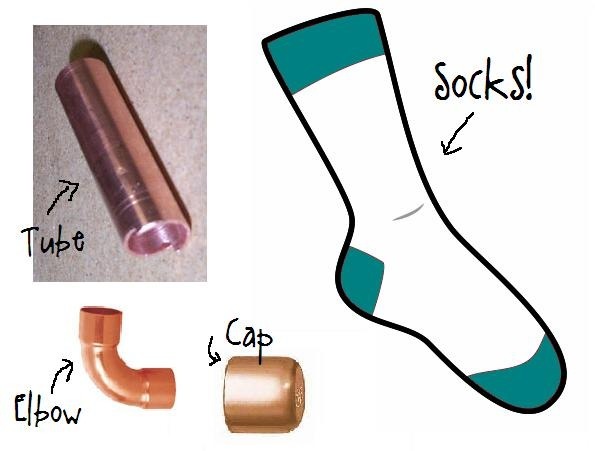 So not surprising I suppose that there are so many different ways to make socks. Toe-up. Cuff-down. Gusset Heels. Short Row Heels and Toes. Tube socks with no heels at all. Round Toes. Grafting Toes Kitchener Style. Sometimes the simpler an item is to construct, the more practical variations there can be! 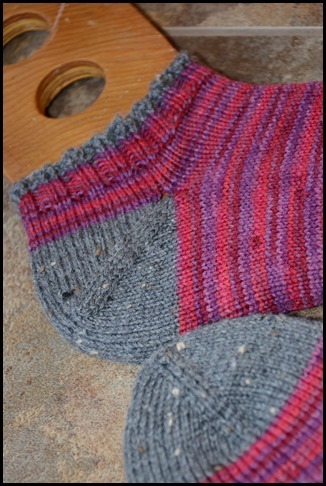 Today, while considering the options for my Iron Knitter Round 3 Socks I got to pondering the whole Heel Dilemma. There are many sorts of Heels, they all get the job done and make the socks fit the foot better... but which one should be favored where? Is there a better heel for a certain situation? I set out today to learn more about Heels. 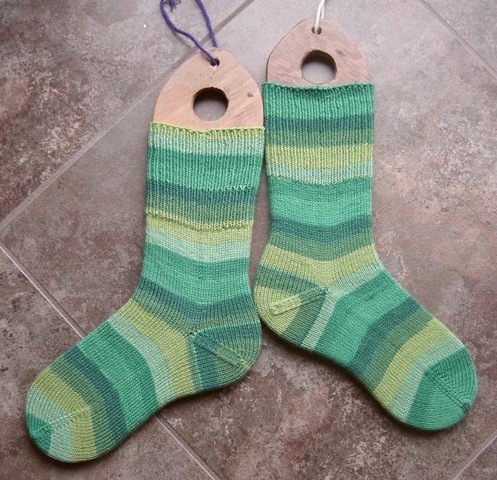 -these are the first heels I learned to make... out of an old really worn out Beehive Yarn Book of socks for the family that my Mom had around the house when I was little. 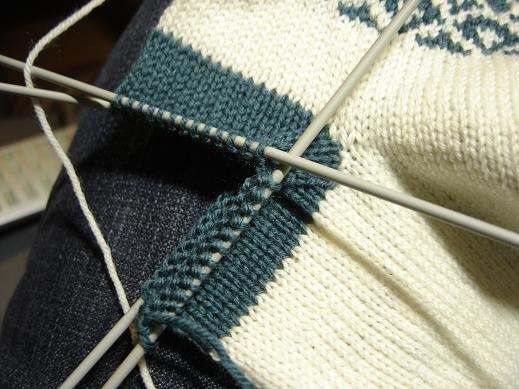 Basically half of the stitches are taken on two needles and then knit back and forth to make a flap, then the flap stitches are decreased in to make a little short rows triangle, and then stitches are picked up along the flap and gradually decreased away as the rest of the foot progresses. 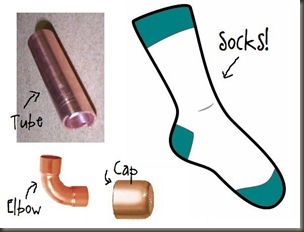 This method is common for traditional Cuff-down socks and makes a comfortable well-fitting heel. 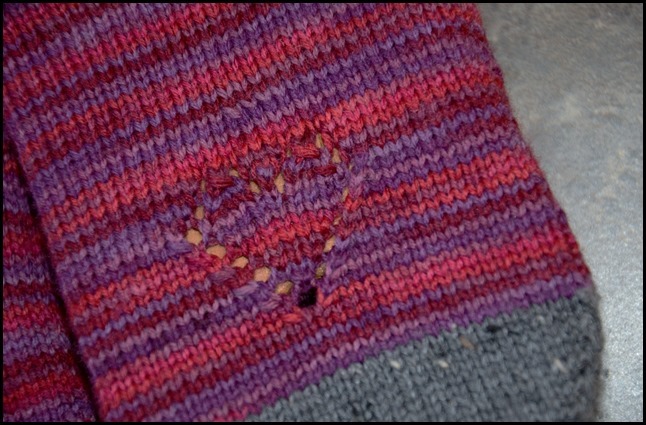 The flap can be patterned or padded (like with a slip stitch design where extra yarn is carried behind) or completely plain depending on the desired effect. - there are lots of patterns out there that like to take construction creativity to new lengths and combine the basics of Gusset / Flap heels and short rows to make unique heels that are part of each method. 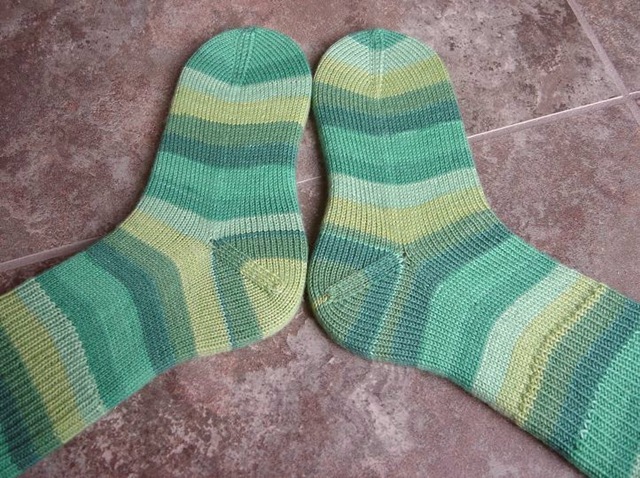 I have made a few pairs of such socks, but somehow I usually end up going back to one or the other - my old standby. I think this is because after having knit about 2 dozen pairs of socks, I can turn a heel without following a pattern or even watching too closely what I am doing. The varied construction ones require me to focus; sometimes I actually like brainless. Now there are two schools of thought on the afterthought heel... one involves the cutting bit and the other a slightly less faint-inducing strategy. 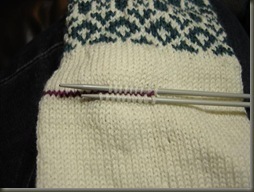 - After finishing the tube, the spot for the heel is chosen, and then you are supposed to snip one strand in the middle of the row and then pick up the required number of stitches (usually half the number of the tube itself) as you ravel across the row by that one strand revealing 2 rows (one above and one below the snip) of live stitches. 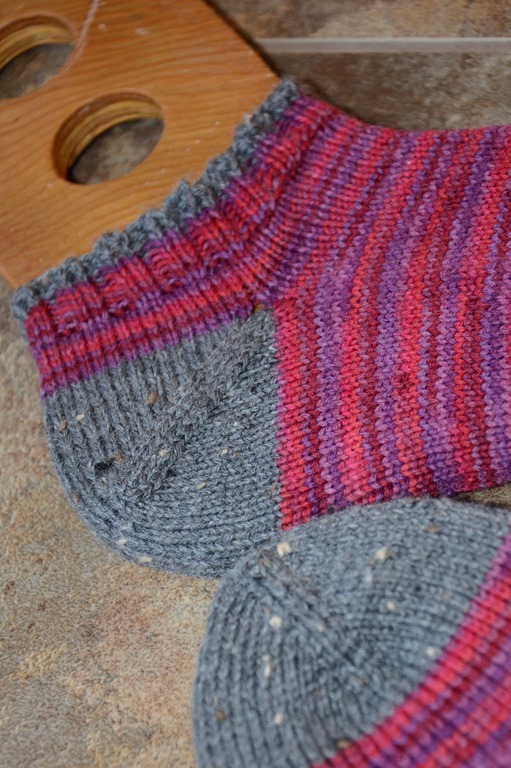 - At the place where the heel should be added, knit across half the row with a waste yarn, and then reknit those stitches and continue in pattern until the rest of the sock is done. This leaves a contrasting yarn "zipper" in the work - all you have to do is carefully start removing that contrast yarn and pick up the live stitches above and below it. 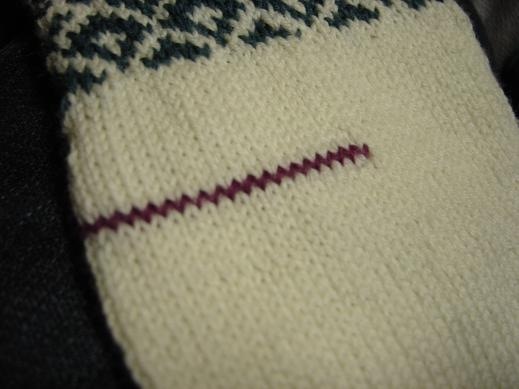 The end result of both methods is the same: you get live stitches where the heel should have been in the first place. 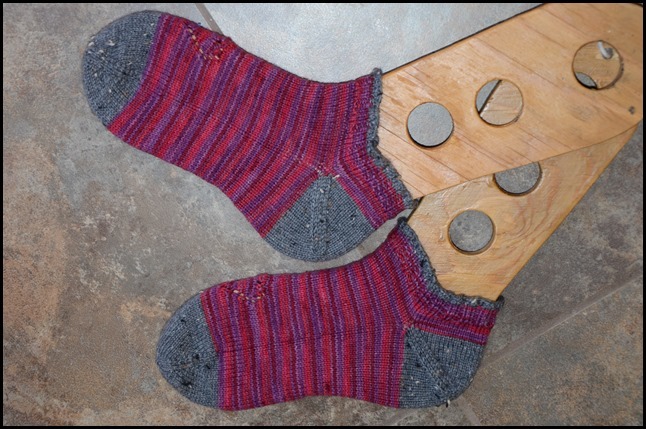 The heel is then knitted in the same way as one normally knits wedge toes (aka decreases at regular intervals creating a wedge) and then kitchener graft the end of the heel. Some folks who absolutely hate/fear Kitchener will actually work "round" heels similar in shape to the top of a mitten, with star shaped decreases and then when down to a small number of stitches draw tight through the remaining stitches and tie off without grafting at all. Ok... here we go step by step! - At the place where the heel should be located... knit across half of the row's stitches in a contrasting color (similar to how you would work the first row of a "short row heel") Knit the stitches with your working yarn again - this results in a waste yarn row sandwiched between two rows of the working yarn. - This is the place where you will "unzip" the waste yarn to expose live stitches upon which to work your heel! - Using a knitting needle, gently pick up the stitches on the row above and below the waste yarn row: The stitches will likely feel tight on your needle. I like to use a needle one size smaller, so they will slide on easier. - See the red stitches between the new white ones? you can start removing the waste yarn before all the stitches have been picked up if you like. I find it easier to pick up the stitches if you loosen the waste row just a little. - Now that you have all of your new "live" stitches, you can now divide them onto more than two needles so you can work around and around just like you were finishing a toe. 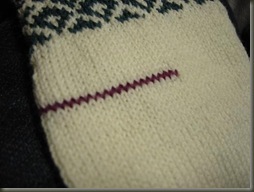 - then use Kitchener stitch to close the back of the heel, just like you would finish a toe and weave in the ends. - if you need help with your Kitchener Technique... go here :) for a great article from Knitty. - Voila! Even though the heel looks a little pointy in this photo it fits exactly like a short row heel, and feels nice and smooth on the foot. - I hope this little tutorial gives you the inspiration and the courage to try working an afterthought heel! 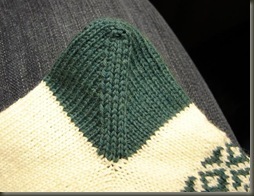 Once it's completed, you really can't tell the difference between this kind of heel and a standard short-rows heel. - The other nice thing about this heel is that it is easily replaceable when the fabric starts to thin from wearing. Basically you just snip and unravel the heel, pick up the same live stitches as in the beginning and work your heel again!